Pint-sized and “a perfect fit” for toddlers! With a seat height of 7 1⁄2", toddlers will have no trouble “seating themselves”. 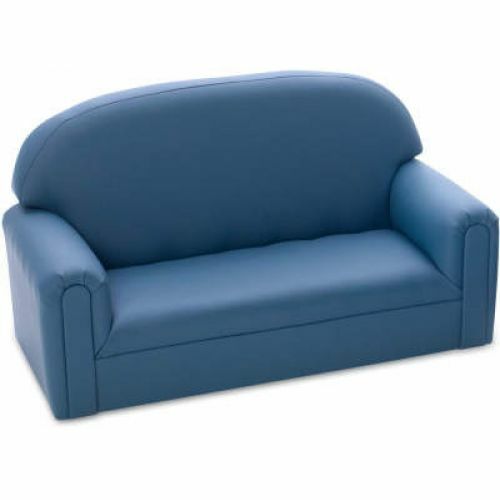 Built with sturdy hardwood frames, comfortable dense foam, and upholstered with premium coverings. Meets ASTM, CPSIA, and CA117 standards. One-year warranty. Ages 18-36 months. 34"L x 16"W x 19"H, 27 lbs. Enviro-Child Upholstery is an eco-friendly and healthier upholstery alternative that is as durable and easy to clean as vinyl. Made of polyurethane, it is PVC-free. Plus, it features an anti-microbial finish that inhibits the growth of bacteria and viruses.